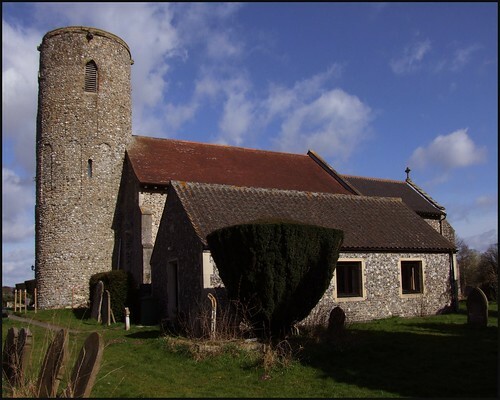 Tasburgh is a large and busy village just off of the main Ipswich to Norwich road, but this church sits away from the houses, up on a hillside on the way to Tharston. The little lane that heads up to it from the south is so sunken and narrow that it has been designated one-way only. The round tower looks rather stark without battlements, making the nave and chancel seem rather larger and more imposing than they are. If you look closely, you can see blank arcading around it, which is a big clue that this is pre-Conquest work. Otherwise, the church was largely rebuilt in the late 15th century and then again substantially renovated in the 19th. A modern meeting room on the north side reminds you that this is, after all, a lively parish, but you step inside to a church with a nice rural feel, with brick floors and light, white walls. There is an interesting collection of arcana on the west wall of the nave, including one of those brass benefaction plates familiar from several churches around here. More curious still are several large plaques above the windows to south and north, painted with biblical texts, which must date from the Victorian restoration. Oddest of all is the decorative painting in the south-east corner of the nave, above and around the piscina. It appears to be in the style of the 18th century. Was the piscina blocked when it was originally painted? Was it intended as the backdrop to a memorial? The wooden panelled altar is very imposing, and the purple riddle curtains and gnarled cross a nice touch for Lent. Rather odd that the altar doesn't appear to fit the riddle screen. In the north window of the chancel is a curious lozenge of early 17th century glass, depicting William Newce and his two wives (not at the same time of course). A modern inscription in glass beside it explains it, and there are other Newce memorials in the church,from just before and after. I am not an Anglican myself, and so the way that the Church of England worships is none of my business. But I do like to keep up to date with the latest Anglican enthusiasms and fashions. I know that Mothering Sunday has become an opportunity for evangelisation, a bait for those who do not normally attend church, in the hope of getting them hooked. This was the Saturday before, and, in place of a nave altar, a screen had been set up in front of the chancel arch for a puppet show. The puppets lay lifeless beneath it, but attached to the inside of the screen was a script. Well, try as I might, I could not deduce any theology from the script at all. Was it just intended as light entertainment? Was I missing the point? It seemed a shame that people not familiar with its rich liturgical and musical traditions might mistake this for everything of which the Church of England might be capable - although, as I say, it is none of my business.